Fire and life safety is a major concern for high-rise office workers, apartment and condominium dwellers, building owners, and the architectural community around the world. From decades of disaster movies to real-life stories from survivors of tower fires and terrorist attacks, the threat of catastrophe is a sobering reminder fighting high-rise structure fires is a difficult and often perilous task. Recent tragedies like Grenfell Tower in London, England, the 2017 Honolulu high-rise fire and the Torch Tower in Dubai, UAE, punctuate this reality. While the spread of fire and flames is commonly perceived to be the biggest threat to human safety in these types of situations, smoke and toxic gas often pose an even greater danger for building occupants. High-rise structures typically include multiple stairways and internal elevator shafts. These enclosures and hoistways can act like a chimney or flue in a fire, allowing smoke to infiltrate otherwise safe floors of commercial and residential buildings. Despite being protected by fire-rated, car-mounted doors, hoistway shaft openings are especially dangerous, allowing hot smoke and products of combustion to infiltrate the area and potentially spreading gases throughout a multifloor building in a matter of minutes. The ability of smoke and hot gases to migrate quickly through unobstructed vertical shafts can result in smoke inhalation and death for those trapped on seemingly untouched or ‘safe’ floors above the fire. To address smoke migration, the International Building Code (IBC)—beginning in 2000—required elevator lobbies to be constructed as smoke enclosures to encapsulate hoistway openings on every floor of a high-rise building. Swinging doors—at the entrance to an elevator lobby—are activated during a fire event to close and seal the space, thereby minimizing smoke and gas infiltration. 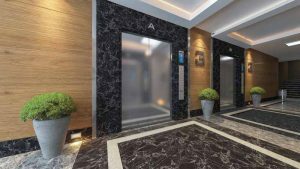 Elevator lobbies have made a tremendous impact on occupant safety, but they also come with significant design and facility planning drawbacks. IBC eventually approved the use of coiling fabric or film closures for hoistway openings meeting Underwriters Laboratories (UL) 1784, Smoke and Draft Control Door Assemblies, requirements in 2003. 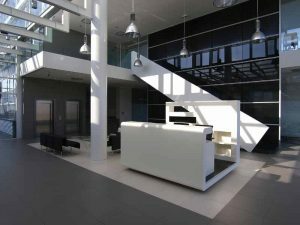 Manufacturers also began to develop new and exciting alternatives to elevator lobbies at the hoistway opening. The use of special coiling smoke doors as hoistway enclosures has quietly become mainstream in the design community. Standards from the National Fire Protection Association (NFPA) continue to evolve to include new opportunities with regard to smoke and fire infiltration in commercial buildings. Whether discussing traditional elevator lobbies or newer products, it is important to understand these developing standards of elevator smoke enclosures and their impact on architects, designers, facility managers, and, ultimately, building occupants. 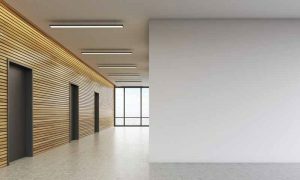 Thanks to advances in coiling fabric and film closures for hoistway openings, architects have new opportunities for designing open-concept spaces. limited access to training necessary to acquire this knowledge of hoistway closures. In the world of doors, however, specialty is good, and knowledge is even better. Armed with these two essential tools, product manufacturers and door dealers can be more instrumental in fire and life safety awareness, education, and problem solving. The first major development in this product’s acceptance came several years ago when IBC approved the use of coiling fabric or film closures for hoistway openings (For more information, one can refer to Section 713, “Shaft Enclosures,” of the International Building Code [IBC].). 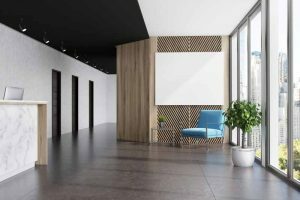 As a result, the employment of these products—for creating additional square footage and more spacious designs in lieu of constructing elevator lobbies—has become popular in the design community. Elevator lobbies can decrease leasable/usable floor space for building owners and constrain more spacious area designs. 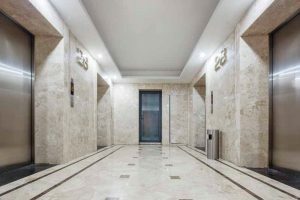 In today’s world of open-concept design, elevator lobbies are often incongruent to the overall conceptual vision, according to Gregory Cahanin, fire-protection engineer and code consultant. Newer sliding-type fire doors complying with smoke and draft requirements are frequently allowed as an alternative to building lobbies. In some applications, accordion-type doors are also employed to seal banks of hoistways. Rolling steel fire doors are specifically not allowed. However, they may be used on lobby designs that also include listed swing doors providing personal egress. If this sounds confusing, it is. Evolving standards from the International Code Council (ICC) and NFPA mean new alternative products meeting intended performance criteria—which are probably more cost-effective—may become available. Modern elevator hoistway closures range from semitransparent film-type materials to woven, coated fiberglass products. The design intent is to seal hoistway openings to prevent smoke migration during a fire, allow for through-passage of car occupants, and to reseal the opening if opened during an alarm for access. Trends in commercial design point toward the continued popularity of open-concept spaces. Due to advances in coiling fabric or film closures for hoistway openings, designers have fewer constraints like elevator lobbies. Since the first steam-powered lifts of the industrial revolution to high-speed elevator cars, vertical transportation has made life more convenient for riders around the world. It has also evolved to meet specific needs of building owners, occupants, and first responders. Public passenger elevators are installed to serve all floors of a building or may have separate banks targeting exclusive floors, which requires multiple lobbies to protect the hoistway from the migration of smoke and other products of combustion. These are a good target for hoistway closures since they do not require the construction of lobbies in the design. Enclosed elevator lobbies are not required where additional doors are provided at the hoistway opening…when tested in accordance with UL 1784 without an artificial bottom seal. Where installed in accordance with Section 3008, passenger elevators for general public use shall be permitted to be used for occupant self-evacuation. Where elevators are to be used for occupant self-evacuation during fires, all passenger elevators for general public use shall comply with Section 3008 (10 sections). Coiling fabric or film closures for hoistway openings provide architects and designers with new possibilities while ensuring the safety of building occupants. This includes limiting the spread of smoke and toxic gases during a fire event. Since these types of elevators are intended to be occupant operated during evacuation periods, they must be in a ‘hardened’ shaft with a one-hour fire resistance rating up to four stories and two-hour rating above four stories. Additionally, occupant evacuation elevators require lobbies at all floors except the level of discharge, meaning there is no code provision for hoistway closures. Unlike public passenger and occupant evacuation elevators, fire service access elevators (FSAEs) provide a capable and durable hoistway with the ability to operate for extended periods during a fire to aid fire fighters and emergency responders in assistance and rescue efforts for all occupied floors. FSAEs must serve all floors. In buildings with an occupied floor more than 36.5 m (120 ft) above the lowest level of fire department vehicle access, no fewer than two FSAEs—or all elevators, whichever is less—shall be provided in accordance with Section 3007, “Fire Service Access Elevators.” Each FSAE shall also have a capacity of not less than 1587.5 kg (3500 lb), shall comply with Section 3002.4, “Elevator Car to Accommodate Ambulance Stretcher,” and must accommodate an ambulance stretcher. Similar to evacuation elevators, FSAEs must be in a ‘hardened’ shaft with a one-hour fire resistance rating to four stories and two-hour rating above four stories. Typically, at least one FSAE is the building service elevator and usually runs in a separate hoistway core from public or occupant evacuation elevators. In buildings with the FSAE requirement, a second elevator can be designated as FSAE—this may be another FSAE or a public elevator. FSAEs are also required to have an elevator lobby from the second floor up as long as the floor of discharge is sprinklered. Therefore, hoistway seals are not required in 2015 IBC 709.4.2, “Smoke-barrier Walls Enclosing Areas of Refuge or Elevator Lobbies,” within FSAE lobbies. Elevator lobbies are also not required where the elevator serves open parking garages per Section 406.5, “Open Parking Garages.” They are not required at levels of discharge as long as this level is equipped with an automatic sprinkler system and wherever the hoistways open to the exterior.